One of our videos will be featured at the 2015 CatVidFest! We are so honored to announce that one of our most popular videos, “What Happens When You Watch Hockey with Kittens,” will be featured in this year’s Internet Cat Video Festival! What is CatVidFest, you ask? It’s the first ever offline celebration of cat videos from all over the world! Our video was selected from thousands of entries to appear in this year’s reel! CatVidFest 2015 kicks off TODAY at CHS Field in St. Paul, Minnesota, and then begins a yearlong tour making stops all over the world. If you live nearby, you should go to tonight’s event! Tickets are just $10! And it’s not just cat videos–there will be artists (painting, puppets, masks, you name it), musicians, nonprofits of all shapes and sizes, games, photo ops, and so much more. Bring the whole family and turn it into family night. And if you’re already going, we want to see your pictures! 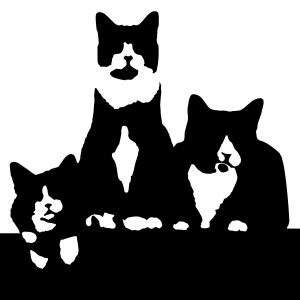 Tweet us at @tuxedotrio and use the hashtag #catvidfest. In case you’ve missed it, here is the video that made this year’s reel. This was taken years ago when Ben and Desmond were playful kittens who just wanted to catch a hockey puck. Enjoy! Check out our other videos and subscribe to our YouTube channel here.